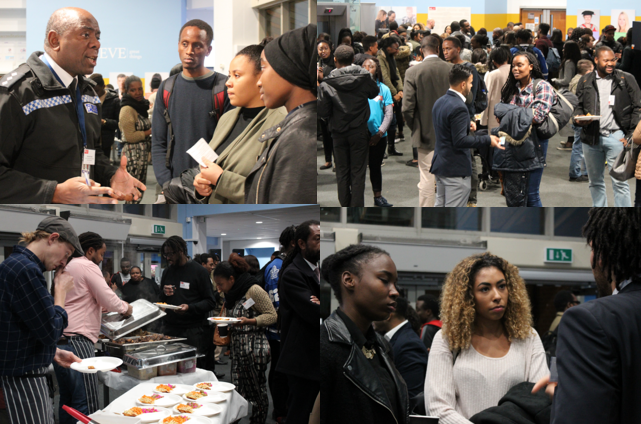 The Bristol Business School and the Bristol Law School celebrated Black History Month 2016 with a fantastic professional networking evening for BME students on 17th November 2016. Over 50 Law and Business BME professionals and entrepreneurs from across Bristol joined us in order to share their career insights and advise our students. Organisations in attendance included Elite Solicitors Ltd, Gregg Latchams, Albion Chambers, Bristol Pound CIC, GE Oil & Gas as well as the Black Police Association. Many professionals in attendance were UWE Alumni who were delighted to return to Frenchay and meet the next generation. Guests and students were treated to a delicious and authentic Caribbean feast provided by the award-winning team at Biblos, managed and owned by UWE Alumni and entrepreneur Will Clarke, also in attendance. The evening included networking activities and talks from finance experts and motivational coaches as well as inspirational UWE Bristol Alumni. Rodney Wilson (UWE Law) Managing Director of Elite Solicitors shared his career journey with a captive audience. Elite Solicitors opened in the heart of Bristol in 1991, it has since become the leading BME-predominant criminal defence and immigration firm in the South West. Solicitor-Advocate Melissa Toney (UWE LPC) spoke of breaking several glass ceilings as a successful young black woman, and of her appearances before the Royal Courts of Justice. She championed our female students to set their sights high and go for it! Rahat Ahmed (UWE Economics) founder of KnowYourPower delivered an inspiring and uplifting account of how he overcame personal struggles to graduate with First Class honours and establish a successful career in finance. Rahat spoke of success, determination and the pursuit of happiness. The event, the first of its kind at UWE Bristol, was a huge success and energised over 100 students in attendance. Our thanks to all alumni who attended the event, which was organised by Dr Zainab Khan (FBL). Tunde Okewale MBE, the founder of the charity Urban Lawyers and recipient of numerous diversity awards, will be delivering Bristol Law School’s Annual Lecture, ‘No one Rises to Low Expectations.’ Registration for this event will be available online soon. Previous Previous post: Business skills for a vibrant economy – are you equipped for the post-Brexit world?